Photos By Ellen Easton 2009 – All Rights Reserved. As of 2014, the Lady Mendl’s menu, tea service, and decor has changed under new management. Any minute, one expects Sherlock Homes to pop into Lady Mendl’s tea salon to ask Edith Wharton a question. An absolutely charming establishment tucked away inside New York City’s Inn at Irving Place. Located in the heart of the Gramercy Park historical district, when one ascends the front staircase, one enters a splendid 1800s townhouse replicating a world gone by. The atmosphere is the closest one can experience afternoon tea in a public venue as if one were in one’s own home. The Inn has several tea parlours in various sizes, accommodating from a small party of ten to larger groups of fifty, each maintains a working fireplace and private restroom facilities. The tables are individually set with crisp white linens, lovingly collected antique porcelain, silver and crystal patterns. A small bouquet of graceful flowers adorns the tops of all surfaces. The attention to the table’s detail is noticed with renowned sugar artist Reva Paul’s hand decorated rose sugar cube on the side of each teacup, as well as tea enhancers of hand cut candied ginger, milk, honey, and lemon slices. The wait staff is both knowledgeable and seamlessly attentive to your every need without being intrusive. Lady Mendl’s five-course seasonal menu follows the traditions of an English tea, but often with an added modern surprise. Implementing French, Russian, and English serving styles, each course is served separately. The first course – the chef surprise of the day, can vary from a mini quiche to a non-traditional mixed salad. The second course – an assortment of seasonal crustless tea sandwiches, served twice, consist of smoked salmon with dill cream cheese on pumpernickel bread, thinly sliced cucumber with mint cre fraiche on brioche, classic egg salad on rye bread and smoked turkey with cranberry on seven grain bread. The third course – freshly baked warm scones (one plain and one with currents) with Devonshire cream and preserves. The fourth course – is what has fast become Lady Mendl’s signature, a tissue paper thin, Twenty-Layer Crepe Cake filled with French pastry cream. The fifth course – ends with an assortment of tea cookies and a chocolate dipped strawberry. All tea service includes freshly steeped, estate grade, loose-leaf tea served decanted at tableside. 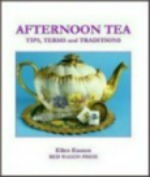 Tea classes and lectures, by Ellen Easton, are held by appointment, for those who wish to learn the proper etiquette, serving and history of afternoon tea. Comedienne Fran Capo, The Guinness Book of World Records’ fastest talking female, achieved on an episode on her show called “Fran’s World” – Fran’s attempt at refinement. It’s no wonder Lady Mendl’s has been named one of America’s favorite tearooms. Whether one is celebrating a special occasion, a new engagement, or just one who wishes to have a relaxing afternoon, from individuals to international celebrities, all are welcome. Informative article about a wonderful place with an incredible history. I took my kids there a few times. Thanks for letting me know they are under new management – I would love to visit again, and take an etiquette lesson like @FranCapo who probably repeated the hour of learning in 5 mins flat! !